Manchester United and their supporters paid an emotional tribute on Wednesday to Old Trafford legend George Best, who died last Friday. 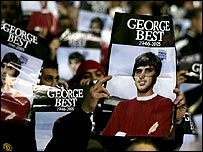 Fans in every seat held up a poster of Best ahead of the Carling Cup game with West Brom, who were also the opponents when Best made his debut for the club. Current United boss Sir Alex Ferguson and Baggies boss Bryan Robson, a Man Utd legend, carried wreaths out. And both sets of supporters impeccably observed a minute's silence. Best's son Calum was introduced to the crowd during an emotional ceremony. "It was the greatest tribute we could give. It was a fantastic night," said Ferguson. "I didn't expect anything different at Manchester United," added Robson. "They are a club that is excellent with ex-players. "It was a fitting occasion and a great send-off. George Best was one of the best players this world has ever seen and it was fitting for him." Best's team-mates from United's 1968 European Cup final-winning team lined up on the pitch ahead of the kick-off. They were joined by members of the West Bromwich Albion side against whom Best made his debut in 1963. Before the game thousands of supporters visited the makeshift shrine outside Old Trafford, which has been adorned with scarves, replica shirts and cards. United legend Best died last week at the age of 59 after organ failure. He had for years struggled with alcoholism. Best's funeral takes place at Stormont in Belfast, Northern Ireland, on 3 December, and United have reached agreement with the BBC to screen the event live in Manchester's Exchange Square at lunchtime. Discussion is still to begin in earnest over a lasting tribute to Best, with a statue the most likely option.